Thanks for joining us for our 4th episode, but our 1st official show here at 2D1F. Thanks to the D&D Show for giving us our break and letting us infiltrate the feed. We’re now listed in iTunes as 2D1F and we’ve got a Twitter account to follow as well. This week, Drew and JB watched the movie The Man from Nowhere, about a quiet pawnshop keeper with a violent past, who takes on a drug and organ trafficking ring in hope of saving the child who is his only friend. 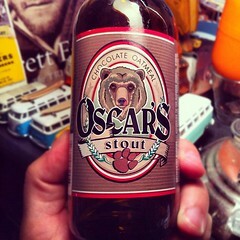 We received a very generous beer donation and procured the very delicious Oscar’s Chocolate Oatmeal Stout to go along with our weekly chit chat.